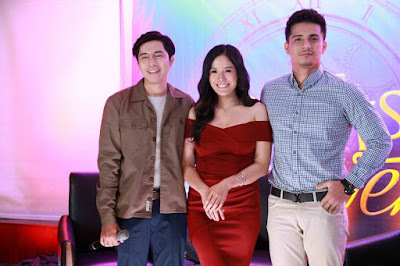 Time will stop for viewers who will witness the much-awaited tale of love that is forever cursed by fate in ABS-CBN’s newest series “The Promise of Forever,” which airs on Monday (Sep 11) in ABS-CBN’s Kapamilya Gold. Viewers will see another side of forever as the upcoming Kapamilya series shows how it will forbid two lovers from getting the love and life they aspire for. Get to know Nicolas (Paulo Avelino), an immortal man who does not age and die. With his condition, he keeps himself from falling in love so he will not feel the pain of losing his loved ones over and over again. But as he goes on with his life alone, he meets Sophia (Ritz Azul), a young girl he saves from a burning house. Thankful for her second life, Sophia makes the man who saved her as her inspiration and grows up responsible and hardworking for her family. After several years, their paths once again cross in a cruise ship where Sophia is working as a seawoman and Nicolas as one of its passengers. Because of Nicolas’ uncanny resemblance to the man who saved her life, Sophia persists on knowing Nicolas and tries to learn about his past. As they spend more time together, they fall in love with each other, but the immortal man’s curse gets in their way and keeps them from having their happy ever after. But aside from the unbreakable spell, Sophia’s lover Philip (Ejay Falcon) will also make sure that Sophia and Nicolas do not end up together and will do whatever it takes to win her heart back. Also putting their lives in danger is Nicolas’ descendant Marlon (Tonton Gutierrez), whose mission is to end Nicolas’ life. Will Nicolas find the cure to his curse? How will Sophia fight for Nicolas with Philip on their way? Meanwhile, “The Promise of Forever” will bring viewers to some of the best and most scenic views in eastern and western European countries such as Czech Republic, Belgium, the Netherlands, and Poland. Also bringing more excitement to the series is its stellar cast that includes Cherry Pie Picache, Amy Austira, Benjie Paras, Susan Africa, Ynna Asistio, and Nico Antonio. It is under the direction of Darnel Villaflor and Hannah Espia. Don’t miss the story of love that is forever cursed by fate, “The Promise of Forever,” airing this Monday on ABS-CBN and ABS-CBN HD (SkyCable ch 167). For more information, follow @dreamscapeph on Instagram and Twitter and like facebook.com/dreamscapeph on Facebook.